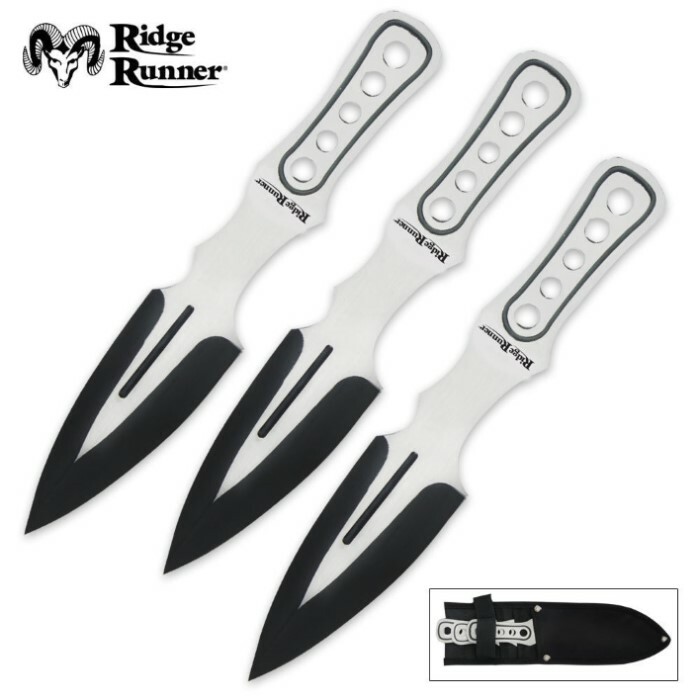 Ridge Runner Sonic Triple Throwers With Sheath | BUDK.com - Knives & Swords At The Lowest Prices! Achieve sonic throwing speed and accuracy with this Sonic Triple Thrower set from Ridge Runner. Designed as one solid piece of cold, hard, stainless steel, each of these three throwers features a large black-coated blade with a contoured, cut-out handle design. The cut-out holes in the handle help these throwers sail through the air at greater speed! Includes a nylon belt sheath to house the set. Bought as a gift but tried them out and got addicted! Well balanced knives and sharp. Would recommend for beginners or old dogs like me for fun throwing. A great price for quality like this can't be beat! I think its magnificent, they stuck very well. they had one problem though, one of the blades got chipped in a small spot from accidentally hitting another blade, but i have to say they work good for me. These were my first set of throwing knives and I was impressed, because I just kept hitting the target. With the Ridgerunner Sonic Throwers, there is also a dull edge to grab for blade throwing which worked out great for me being a beginner.